The cardinal flower is named for the vibrant, red color of its flowers. The red color brings to mind the bright red color of robes worn by Roman Catholic cardinals. Three lower petals and two upper petals form each of the cardinal flower's bell-shaped flowers. As with other bellflowers, the cardinal flower is only pollinated by hummingbirds that feed on the nectar. Native perennial that can be one to six feet high. Flowers are in bloom midsummer to fall and have long bloom times. All parts are poisonous, but toxic only if eaten in large quantities. The cardinal flower has a shallow root system, which renders the plants susceptible to root heaving. Freezing temperatures can lift the entire plant out of the ground. 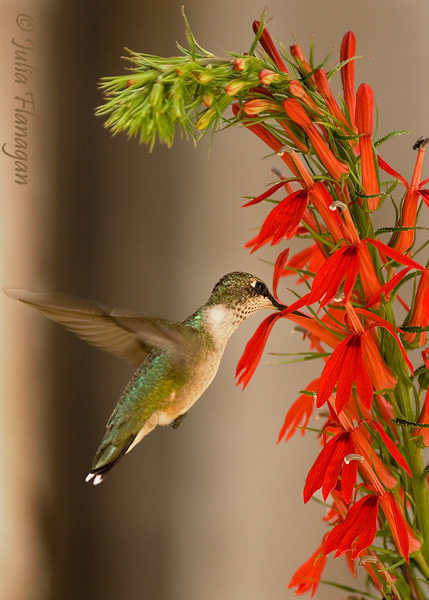 Because of the brilliant red color, long bloom time, and the flower's ability to attract hummingbirds, the cardinal flower is a popular choice for gardens. Although relatively common in areas with moist soil, over-picking of this beautiful plant has resulted in its scarcity in some areas.